PenangUncle.com finally has it's own very first hardware review. Bought at 11st with 50% discount coupon, this Strontium Nitro 32GB microSD Card Review looks like a real deal. Enjoy the review video! One of the things I like to do while watching drama or youtube is doing survey. Sometimes the drama or youtube video become too slow and nothing else to do while waiting for it to go through, completing survey is a great thing to do and you can earn money while doing it! iPanelOnline is one of the multinational survey companies, the filtering criteria sometimes quite strict, so I only get 1 out of 10 to do. Probably the company has to put a better filter for its members. Contrary to that, I get to do the right survey. Click the link below to start your earning money! The first China made Nexus (others are made in China, not China made, get it?). Too bad it scored 2/10 only, so prepare to buy a new phone when it is broken. Microsoft is trying very hard to produce products that people only like after Apple reuse the design and put an apple logo on it. How many times this iMac has been refresh? I don't care. But it is still impossible to repair, as usual. This teardown is not a regular teardown where you get the repairability score, this is just to know what is inside/in between the display of iPhone 6s. New iPad Mini 4, it's thinner, lighter, powerful-er, yawn.....zzzzz...... What else you can do with it Apple? It scored 2/10 at iFixIt for repairability, meaning don't hope to fix it once you break it. Just go to buy a new one if tragedy happened. Starting this year, I received many sms regarding "promotions" at gambling websites. Even though it is normal to receive phone calls and sms from bank or insurance or investment firm, this is getting too annoying. Therefore I start to block these numbers on my phone. 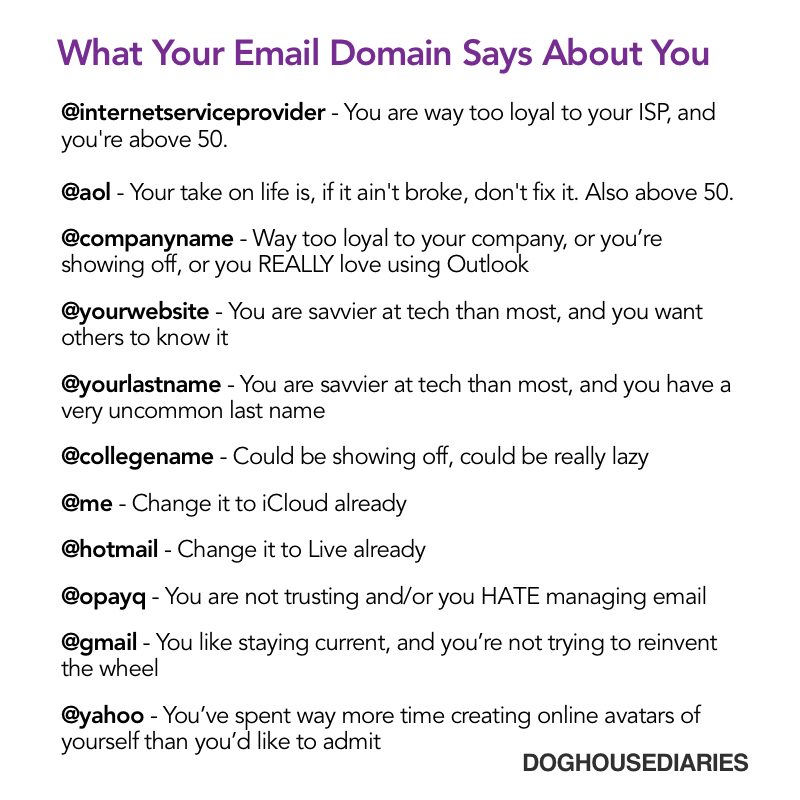 The purpose of this post is to share the list of phone numbers that I put into reject list. If you want to get a new number, please avoid these because I might many more people will put these number in reject list. If you planning to get a new number, get 01x-<8-digits>, don't reuse 01x-<7-digits> because some might be used for not so fun jobs. Okay okay, this is not the GOD mode that you use on games. However this is quick way to access all Control Panel items, in one click only (I mean double clicks). 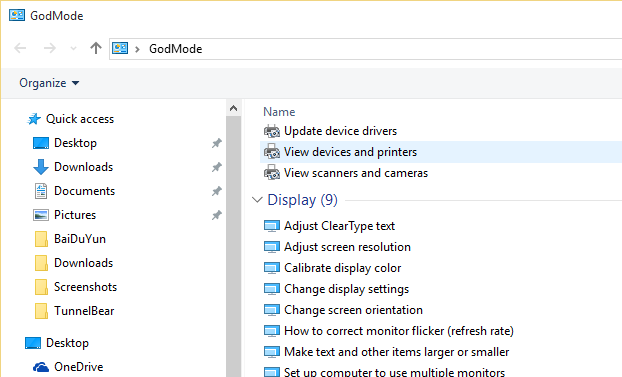 You can change "GodMode" to something else. But I am going to keep it as GodMode, just for fun. And this works for Win7 until Win10. Before you going to watch Avengers: Age of Ultron, and you might missed out a few of Marvel movies, here a tutorial for you all. parent should watch this video in case your children ask you the 'why' questions during or after or even before Age of Ultron. guys should watch this video in case all of your friends know everything about Marvel universe. boy friends should watch this in case your girl friend(s) ask you the 'why', 'who', 'what', 'where' questions. Here is the teardowm of Samsung Galaxy S6 from iFixIt. S6 is 1 point easier to repair compare to S6 Edge, but it still still low at 4 out of 10. If you never see how easy the customization on Android, you would say wow. But I am already using this similar mode on TouchPal Keyboard on my Android table. I can even change the side of the keyboard so that anyone with larger or smaller finger can type comfortably on Android tablet. Anyway, see the video from Windows Central. Windows 10 might have the future. From super easy to repair to super hard to repair, Samsung has done a 'good' job recently on Samsung Galaxy S6 Edge. No SD card slot, no user replaceable battery, no USB3 port, 'nice' work Samsung! Boeing published a video on youtube on the flow of building and assembling their next-generation of 737 in a slightly more than 2 minutes. why Apple Watch cost 10k USD! CollegeHumor created this video to explain why Apple Watch cost 10k USD! It is already 2nd day of February of 2015. Have you kick-start any of your resolution? I have dump resolution method few years back. I don't create a few resolutions on New Year day, but then regret that I never do anything about it. I just don't do that anymore. Nowadays I only focus on the work on the life goal that I have. Some are big goals, so that need a few years to complete. 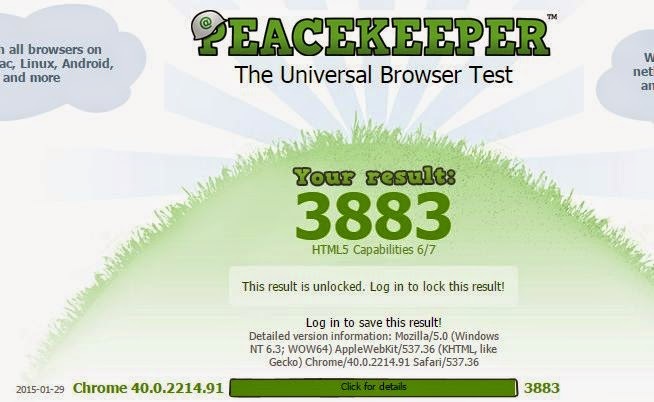 For Internet Browser Showdown post, I only compare on Windows. I might be doing for Android, maybe, hahaha. 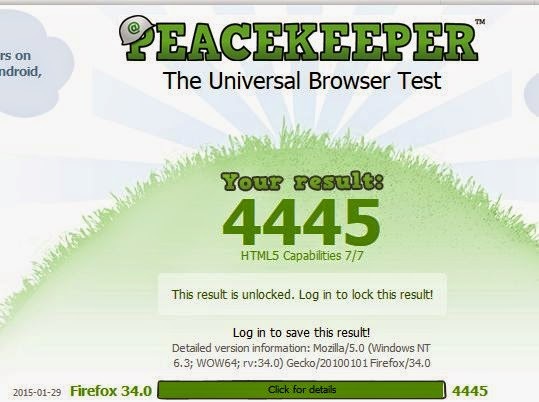 I used peacekeeper from futuremark to do the comparison. This is just a data only, it is the daily experience the matter the most for you. 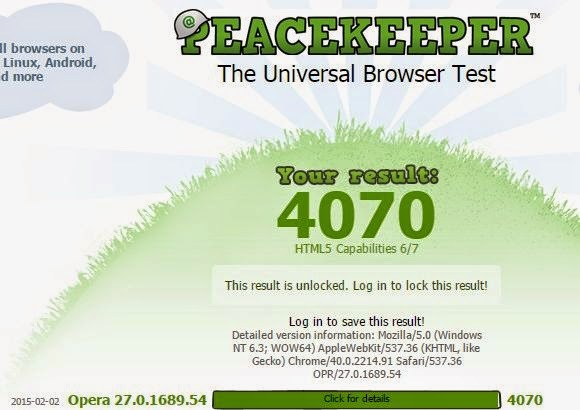 peacekeeper will do many tests and at the end it will give the total score. Many of the test are focusing on HTML5 (which youtube have moved to) as well as playing different kind of video (codec) on the fly. 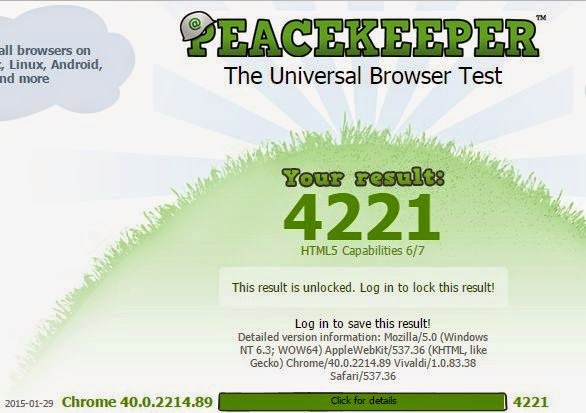 In this post I also focus on the total score with some personal experience on these browsers. Bracket is the version that I used for the test. So who is the champion? Let's start from the bottom of the packs. 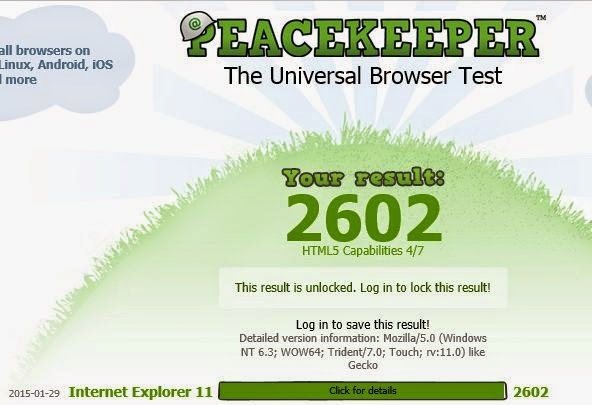 The worst score must be coming from Internet Explorer! The version that I used is IE11. It only has 4 out of 7 HTML5 capabilities. Maybe people stuck with IE because that is the only web browser approve by their company. Personal laptop/desktop would just leave the IE alone from the moment Chrome or other web browser being installed. The only IE being use is to download Chrome or other browsers. That's what happen to my 1 year old HP laptop. Pale Moon supposedly the better FireFox. 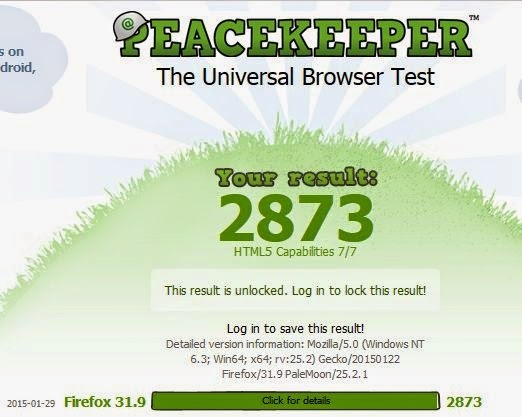 It is the lighter and faster FireFox, at least claimed by Pale Moon and many people. I was surprised by the result. HTML5 is 7 out of 7. But other tests drag the total score low. I like the speed of Pale Moon on android, so far I feel it is the fastest. I might do an android web browser showdown in future. This is my daily driver, I basically do all my online surfing on this browser. This caught me surprised as well because it score lower than other popular browsers. One of the thing to get this browser run smoothly is to have at least 8GB of RAM on your Windows8 and above. Even though it is fast, some people stay away from it because lack of add-ons choices that we enjoyed on Chrome. If you are just purely surf net, Opera is always a good choice. For those who don't know what is Chrome Canary, Chrome Canary is like beta of Chrome Production. Google let people try out new features on Canary and after getting feedback and fixes, the features then push down to Chrome Canary. Not too long ago, there was a bug that the Chrome Canary keep on running with high CPU usage even though just one website page (any site) being loaded. Recent update has get rid of the issue. Vivaldi is the new creation of the original creator of Opera. The creator of Opera left Opera because Opera no longer going to the direction he desire, therefore he left and created Vivaldi. Indeed it is quite fast, putting Chrome and Opera behind. The number one of this showdown is FireFox. FireFox was my daily driver until I feel it is too slow. That was few years back, when they haven't switch to Chormium. It was memory hog back then because of memory leak issue. I seldom use it nowadays but only use it for the DownThemAll add-ons. It is still the best downloader. There you go, the speed showdown of Internet Browser. Which one is your pick? Let me know the comment. p/s: I don't do for Safari, because I don't like Safari, that's all. Everything is awesome! Admit it, this song stuck in your head for some times after you watched it last year right? Now watch the honest trailer! source: honest trailer at youtube! Great about technology nowadays is everyone can be as creative as possible. See how Star Wars: The Force Awakens (Star Wars VII) being made into 8 bits! Sometimes we have to "just do the job", however we can heat it up and enjoy it. Happy Friday everyone! If you have played Suprt Mario Bros2 before, you know you have spent many days or months to complete it. Now this guys just spend 30 mins to complete it. Watch the video for 30 mins, or just jump to time 28:00 to watch him finish the last level and beat big boss at final level. I would complete all the games by now if I have 1/2 of his skills.